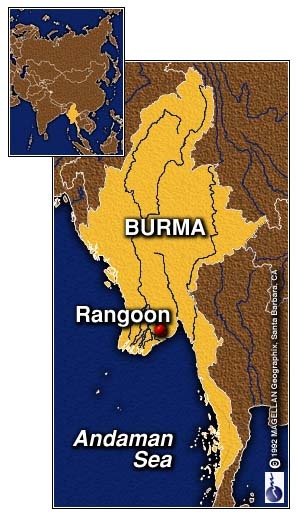 RANGOON, Burma (CNN) -- Burma's military government confirmed Tuesday that it had detained 559 pro-democracy activists over the weekend and indicated it would continue blocking public speeches by their leader, Nobel laureate Aung San Suu Kyi. Officials of the ruling State Law and Order Restoration Council (SLORC) told a news conference the detainees would soon be released but that some might be subject to separate legal action. They also said roadblocks on the road to Suu Kyi's house would remain in place until the government was sure her National League of Democracy party (NLD) had no plans to meet or create any disturbance. "Deterrent action will be taken against any person or organization not adhering to the rules and laws promulgated by the government," said Col. Kyaw Thein, a SLORC spokesman. Laws passed in June ban demonstrations and speeches deemed to endanger peace, effectively blocking Suu Kyi from holding her weekend meetings or speeches at her home. The Saturday and Sunday speeches, attracting thousands of people, were Suu Kyi's only direct communication with her supporters and the international media. They had been held every weekend for more than a year, rain or shine. SLORC officials claim Suu Kyi has been trying to cause unrest and confrontation with the government since she was released from six years of house arrest in July 1995. But Kyaw Thein produced no evidence for the military's contention that allowing Suu Kyi's to speak in public would incite riots. His superior, deputy director of intelligence Col. Kyaw Win, said the regime was actually not worried about riots or disturbances. He said it feared that Suu Kyi's party might make "demands on the government that would complicate the situation internationally." "The media might report it as a demand made by 45 million people (Burma's population) instead of just one political party," Kyaw Win said. The NLD won a 1990 general election, but the military refused to allow parliament to convene. Kyaw Win's statement was a rare acknowledgment that the ruling generals do take international opinion into consideration. Opponents of the military regime have proposed boycotts and other economic sanctions to pressure it to improve its human rights records and install a democratically elected government. The United States, Britain and international human rights groups have condemned the detentions and demanded the immediate release of detainees. Correspondent Tom Mintier,The Associated Press and Reuters contributed to this report.